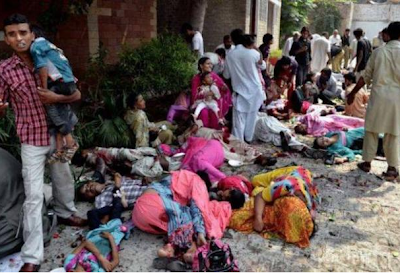 The National Catholic Reporter throws the Pakistani Christians to the Muslim Brotherhood "lions"
Today, the National Catholic Reporter carried a bizarre article by a Maureen Fiedler, which following the theory of the Islamist scholar, Akbar Ahmed, suggests that the bombing of Christian civilians in Pakistan the other week was due to the use by American Forces of drones. Was this article just morbid and distasteful buffoonery, or also laziness to follow-up as to who this Ahmed is? The only other alternative is sinister. The following background check was done quickly, and easily. One wonders why Fiedler did not do so. I leave that up to your imagination. NCR should now request Fiedler's resignation; or terminate her association with the paper. How can one square this disgusting article with the NCR's own editorial policy? Who is this Akbar Ahmed? He is an Islamist, with direct links to an organization called the International Institute of Islamic Thought (IIIT). An excellent background primer on this duplicitous character by may be read here. This same group is a front organization for the terrorist group, the Muslim Bortherhood. The IIIT also has ties with another Brotherhood front, the Islamic Society of North America (ISNA). American readers may be interested to know that ISNA has just had its charitable status revoked in Canada due to ties to terrorism. The following link is more than enough to sober us up to the incredible dangers of Islamism. We also need to carefully differentiate between regular, peaceful Muslims, and vile, despicable murderous Islamists, just as we differentiated when dyspeptic IRA gunmen indulged in murder and mayhem. IRA history became at one point muddled, when these sickos actually collected cash from anti-British "Catholic" bigots in the USA. Though some IRA terrorists at times claimed to be "Catholic"; the fact is that they were not. Membership in the IRA resulted in excommunication. Some ignorant Catholics are still coming to terms with the dark history of the IRA. Not all Irishmen were terrorist, nor supported/excused terror - the same applies - thank God - to Muslims. Yet, with Islam, we have a problem that Islam will have to eventually confront: the various Qu'ranic texts that do advocate violence. This post, being very modest, leaves up to scholars how Islam should reform itself (if possible). This post is merely to recall us Christians to the fact that simple Muslims are being massacred by Islamists. We need to support these people too. Islamism is the enemy of humanity, not just Christianity. All Muslims, must, unconditionally, renounce the doctrine of armed Jihad: if they do not, they are Islamists. The Council of the "media"... and now: the Interview of the "media"? One of the final public addresses by Pope Benedict was his assessment of the Second Vatican Council before a large gathering of Roman clergy. The then Holy Father opened his mind on the terrible, indeed cancerous influence of the media upon the Church, the Council, its interpretation and application. The corruptive influence, in many cases, rather than be opposed by the clergy, was imbibed and exacerbated by the clergy. By 1968, Pope Paul was speaking of "renewal yes, rebellion no". In that Year of Faith, the Holy Father had to issue his Credo. In its doctrinal content, the Credo carried more weight than the entire Council. It was rejected out of hand by the media, ignored by most of the clergy. The bitter fruit became well known. In some ways we are seeing a parallel of the "council of the media", with the "interview of the media" (and the usual clerical suspects). The next few weeks and months should provide more than ample time to "assimilate" the interview and to determine its efficacy. here was the Council of the Fathers - the true Council - but there was also the Council of the media. It was almost a Council in and of itself, and the world perceived the Council through them, through the media. So the immediately efficiently Council that got thorough to the people, was that of the media, not that of the Fathers. And while the Council of the Fathers evolved within the faith, it was a Council of the faith that sought the intellectus, that sought to understand and try to understand the signs of God at that moment, that tried to meet the challenge of God in this time to find the words for today and tomorrow. So while the whole council - as I said - moved within the faith, as fides quaerens intellectum, the Council of journalists did not, naturally, take place within the world of faith but within the categories of the media of today, that is outside of the faith, with different hermeneutics. It was a hermeneutic of politics. The media saw the Council as a political struggle, a struggle for power between different currents within the Church. It was obvious that the media would take the side of whatever faction best suited their world. As the days have gone by, it has become quite evident that poorly catechized Catholics, the "world", etc. are seeing this papal interview "through the media". Not having the precision of an encyclical, this interview is being twisted towards a "different hermeneutic"; being manipulated for a media created political power struggle: as examples, the New York Times and the Guardian distinguish themselves in promoting the politics of homosexualism, and abortion....one "current" within the Church has already revealed its hand: Jesuit blogs and journals have been active in promoting dissent and becoming de facto, he "faction best suited" for the media. Neither has television been absent: consider CNN's interview with Fr. Thomas Rosica. Dubium: Whether the teaching that the Church has no authority whatsoever to confer priestly ordination on women, which is presented in the Apostolic Letter Ordinatio Sacerdotalis to be held definitively, is to be understood as belonging to the deposit of faith. Responsum: In the affirmative. Via Facebook, from a theology student in the United States. This link is provided to us, courtesy of the Jesuit Post. Our Twitter feed also provides links. As mentioned earlier, this is but part of an organized effort by certain Jesuit elements, and other supporters to precipitate a coup against the Papacy. On this blog, we will expose the enemies of the Pope and the Church. Long live Pope Francis. The following letter speaks for itself, but reflects the degree of rebellion. In the words of Pope Paul VI: renewal yes, rebellion, no. When I heard that America was publishing an interview with you, I was intrigued. Over the past six months, this beleaguered Catholic woman has been encouraged, time and time again, by the pastoral approach you have taken to your ministry. 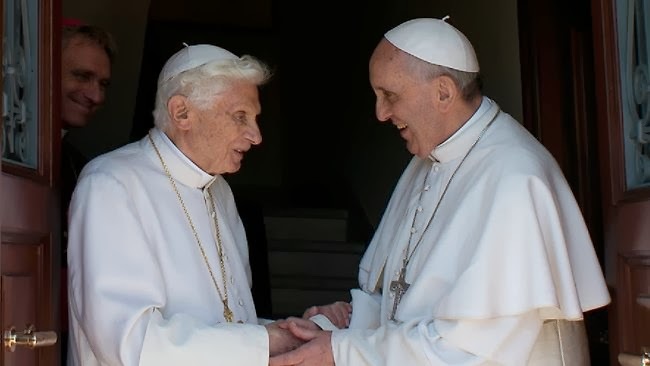 In my work at a local Catholic parish, I have heard our parishioners talk about how they now feel proud to be Catholic in a way that they simply did not under the papal leadership of Benedict XVI and John Paul II. It seems that you, the Argentinian pope with the hipster glasses, have made it a little easier for us to “out ourselves” as Catholic in the cosmopolitan East Bay of San Francisco, heavily populated with the ranks of the spiritual but not religious. However, for all the encouragement I have experienced as a result of your actions—efforts at reconciliation with key figures in Latin American liberation theology like Gustavo Gutierrez, OP; a statement that discourages the passing of judgment over our gay brothers in Christ; a statement that calls for forgiveness of our atheist and agnostic brothers and sisters for turning away from God—I have found myself disappointed and frustrated at the same time. As much as I value the change in pastoral approach from your predecessors, I feel equally unsettled by the lack of concrete and decisive action for doctrinal change. In fairness to you, I acknowledge that you’ve been charged with this ministry for just a handful of months. Please know that I deeply value the pastoral tone you take with your flock. And I see the moves you take not only to uplift the poor, but also to call to task those who create the global structures that keep those people poor. In many ways, you are calling our church and the global community to get our collective priorities in order. While we’re talking about priorities, though, I’d like to suggest two more areas where pastoral concern could lead to the kind of doctrinal change that could heal wounds to which the institutional church has too often turned a blind eye. I’m thinking about what it might be like to be a gay, lesbian, or transgendered person in parts of Africa where such sexual identities are seen as crimes punishable by death. Members of the LGBTQ community the world over encounter oppressive structures that violate the very human bodies we claim to value as a church community, and we need to stand on the side of those children of God who are among the most vulnerable in our midst. And I’m thinking about what it’s like to be a woman in the Catholic Church. I look around at my female classmates from divinity school, at my fellow lay ecclesial ministers who are women, and I see the ways they are of service to our parishes, schools, universities, soup kitchens, and hospitals, among other places. I see women serving the economically poor in the favelas of Brazil and the spiritually poor in upper-middle class parishes in the United States. Reflecting on the reality of what we do, I am convinced that we, too, can stand in persona Christi, and that the global church would be better served for it. The pain that my sisters in Christ who are called to ordination within our tradition is real, and that pain needs tending. Those women called to ordination not only need to hear from the institutional church that their exclusion from Holy Orders is worthy of lament, that the institutional church is sorry for the pain it has caused, but also that it will make amends by making room at the altar for all who are called to celebrate the sacraments. Their pain needs tending, and the church needs their ministry—not because of a mysterious feminine genius, but because of the diversity of gifts with which God has blessed them, a diversity of gifts of which the People of God are in desperate need. Please know how heartening your ministry is to those of us in the church whose needs have gone unacknowledged in years past. It gives me hope that something new is arising within the shell of the old. Pope Francis: "there is a temptation...the devil tries to create internal war..."
Peter Seewald: Is a new tone, a new sound needed in the handing on of the faith? Cardinal Ratzinger: Yes, I think so. The fact that there is so much weariness among Christians, at least in Europe, does show, that a new tone is needed. In this connection, I read the story of an orthodox priest who said: I have tried so hard, but the people simply don't listen to me, they go to sleep or simply don't come at all. So, something must be wrong with the delivery. That is an example of experiences that others have too. The important thing is that the preacher himself must have an inward relationship with Holy Scripture, with Christ, out of the Living Word, and that as a man of this time in which he lives and which is his, and from which he cannot escape, he inwardly assimilate the faith. And then, when he can really speak the faith out of a personal depth, then the new tone will come entirely by itself. (p.261). Ratzinger, J. (1997). Salt of the earth. Ignatius Press, San Francisco, CA. The people over at GetReligion.com always amaze me. It is a blog run by a journalist who has been on the religion beat for many years and has seen how badly the media generally does when covering religion stories. The title comes from the quote on their masthead "The press ... just doesn't get religion." They do one thing and do it supremely well. I noticed in the comments that the one person who tried to hijack the combox for a discussion of the issues was pointed back to the journalism discussion. This offering is as good an analysis of the press coverage in the wake of Pope Francis' interview as I have seen anywhere. I really have to wonder why it is so difficult for people to get Pope Francis? They had no problem at all. So begins a fascinating interview with Pope Francis published on Sept. 19. The interview rocked the world, with some claiming the pope is a “flaming liberal” and will take the Church to the left, while orthodox Catholics feel betrayed. Both sides are wrong. The interview has to be taken in the context of the relativistic world we inhabit. He was trying to give us a strategy for converting the world. He was not pulling back from our positions against abortion, birth control and gay marriage. An excellent post by Susan Fox, as she reflects on catechesis and the Papal Interview. Are the Jesuits trying for a coup d'etat with the Papacy of Pope Francis? Much more to come in following days on this issue, but I am gravely concerned that there seems to be a concerted and organized effort by certain elements within the Church to implement a malignant coup d'etat against the Papacy of Pope Francis. As will be shown in an upcoming post, there is no change- even in tone - from the papacy of Francis' revered predecessor. Enough, at this moment, to provide you with a link to commence your own reflections on what is transpiring. Beware: charitably, but firmly, this blog will excoriate and expose this activity. Much of it operates on mental reservation..... even a reasonably prominent American-born, Canadian priest in reference to a question on CNN about women's "ordination" replied at one point when being pressed by a frustrated Becky Anderson due to evasiveness:"...at this moment in history, ordination is not...". Admittedly, he was cut off by the reporter, due to a breaking story, but the phrase is now out there. What did he mean? Does he accept the Church's teaching, but, but... maybe at some time in the future....? Do we have some sort of mental reservation? Tarek Fatah: Renounce the doctrine of violent Jihad ! 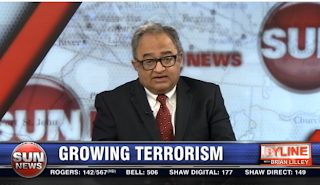 Canadian Freedom fighter, Tarek Fatah has spoken out - once more - with power and eloquence on the blindness and absolute refusal of major news agencies to come to terms with, and call out the vile and evil doctrine of Jihad which is sending - on a daily basis - hundreds of peaceful Muslims to their deaths at the hands of these monsters. Do you know that Jihadis gouged out the eyes of Muslims soldiers for daring to put on an UN uniform? 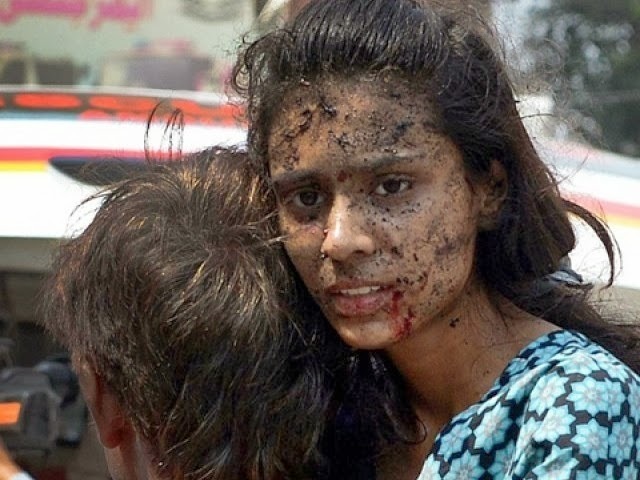 You may know of the church being bombed in Pakistan; do you know that there have been incidents of Christian children being cooked in ovens in Iraq? Are you aware that the Jihadi terrorists in Kenya also took malignant pleasure in ensuring to single out Sikhs for extermination? How many in the "free" media told the world of the throat-slitting in the Syrian Christian town of Malaula - of even woman and children!? Are you aware that a good five hundred - that is correct - 500 organizations in Canada have at least indirect and sympathetic ties to Jihadi terrorist groups? Don't take my word for it - watch Mr. Fatah. Are you aware that the terrorist organization, The Muslim Brotherhood (that has infiltrated right into the White House) - now expelled from Egypt - is, wait for it, relocating its media offices to London!! The city of my mother's birth, the centre of the once great British Empire, the city founded by the Romans, one of the greatest cities of western civilization will now host, like a grotesque canker, this abomination. I leave to your own conclusions the possible judgment of history on the men who have allowed all this. The past week has shown how dangerous a place the internet can be. The reaction by many of us to the Pope's interview, to others' reactions, and counter-reactions should be cause for us to re-access ourselves in the light of the Gospels. If we are not blogging - and I must place myself under such examination - for the love of Jesus Christ and His Church, then we should be silent. Have I been guilty of failings, or at least, have some of my posts been interpreted as such? Guilty on both charges and I must change. I hope, dear reader, that you will see a change in substance. We are all prone to making mistakes on a good many things. A refusal to take into consideration others good sense and correct reasoning shows a shallowness of mind. Blogging, as I see it, is a form of conversation. And what is conversation? It is, in the words of Canon Raymond de Saint-Laurent: "an exchange of views between people of good breeding". This, implies civility, even amongst people who may hold very strongly opposing positions. Civility is, as we all probably have noted over the past week, severely lacking. A few years ago, we were all witnesses to a monstrous lack of civility following the Regensburg comments of Pope Benedict. The inability of Islamists to engage in the art of conversation, to believe themselves personally infallible, to deny others the right to an opposing opinion, to deny others the right to speak, all the while insisting that they have the exclusive right to do so, led them to behave as their ancestors did: "believe or die". A dreadful, and in that case, a deadly mentality. Do we wish to end up like them? Have we ceased to be the inheritors of western civilization? If we can no longer conduct conversation amongst ourselves then we are reverting to a form of barbarism. Frightening. St. Thomas More said - I am paraphrasing from memory - "dialogue exists when two friends of the truth, yield to the light and only the light". Note that dialogue (as the very word suggests) involves two people, two sides: it is not a monologue; it is also a sincere attempt by all to seek the truth of the matter. Did we see any attempt by the murderous and rioting Islamists to dialogue, to seek truth? Scimitar in hand, they indulged in outrageous acts of barbarism and murder. Shut the Pope's challenge for dialogue by mob violence. Sickening and depraved. The dust really needs to settle to see the full outcome of the papal interview. This is another grave danger of the internet: its immediacy; obstructing the necessary need to hold back, think, reflect and then to comment; to engage in conversation, to agree, to disagree, to agree to disagree... all signs of civility. As Catholic Christians, as children of western civilization, we have a duty before God and man to behave in a civilized manner, irrespective that all around us incivility (in its extreme form manifested by savage Islamists) rages. St. Francis de Sales has a number of beautiful suggestions on the art of conversation and dialogue in his Introduction to the Devout Life. I strongly urge each and every reader to refresh him or herself. In conclusion, incivility will sadly continue to rage. Let it not be said of us. From Australia comes news that Pope Francis has affirmed the excommunication of arch-heretic priest, Greg Reynolds. So much for Pope Francis being a secret, closet "heretic" himself; a "flaming liberal". Pope Francis will continue to confound us; he will, as we will be shortly proving on this blog, continue in the exact same vein of approach to the Church and Her problems as the venerable and much loved Pope emeritus, Benedict XVI did. Dissident priest Greg Reynolds has been both defrocked and excommunicated over his support for women priests and gays - the first person ever excommunicated in Melbourne, he believes. The order comes direct from the Vatican, not at the request of Melbourne Archbishop Denis Hart, and apparently follows a secret denunciation in the best traditions of the inquisition, according to Father Reynolds. 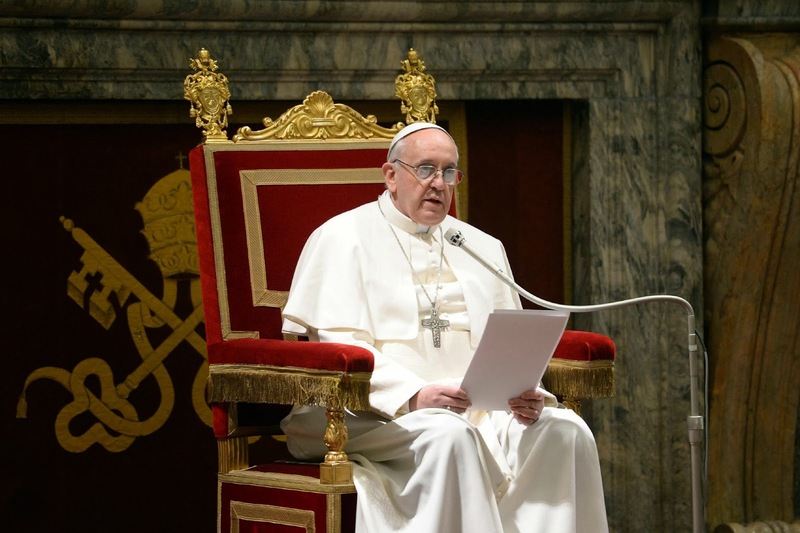 Pope Francis: Will no other major Christian voice join him in condemning Islamist violence ? Yesterday, on his weekly radio show, Canada's indefatigable freedom-fighter, Tarek Fatah, lamented that no Christian voices are even standing up for the forgotten Christians of Pakistan. To para-phrase Tarek: "what would a Sunday morning be without some Muslims blowing up a church". Well, amongst major voices, he did get one wrong: the Pope did speak up. Did your bishop ? - if not, shame on him. And he had more than enough time; after all, 178 Christians were slaughtered in another Islamist attack just last week in Nigeria. Your bishop spoke up on that one, didn't he? Why are Christian leaders silent? Do they not want to "offend" Islam? Perhaps they don't care about what happened because those who died were brown and poor? And where are all those "social justice" churches? Where is the United Church on all of this? Or, the various eccentric Gaza boat storming "peace flotilla Christians". We probably can't expect much from these. but we certainly should expect much, much more from our bishops! 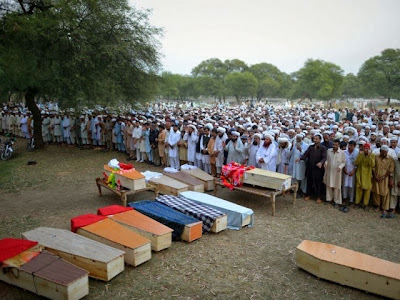 Shame on those of them who are silent and will remain silent. (Vatican Radio) Pope Francis on Sunday condemned a blast at a church in Pakistan that killed at least 78 people as an act of "hatred and war". In unprepared remarks at the end of a one-day trip to the city of Cagliari on the Italian island of Sardinia, the Pope said :"Today, in Pakistan, because of a wrong choice, a decisionof hatred, of war, there was an attack in which over 70 people died. This choice cannot stand. It serves nothing. Only the path of peace can build a better world." Pope Francis then prayed with the crowd for the victims. The world can only be "consistent" without God. His freedom will always threaten it with inconsistency -- with unexpected gifts. A god who is fitted into our world scheme in order to make it serious and consistent is not God. Such a world is not to be taken seriously, such a god is not to be taken seriously. If such a god is "absent" then doubtless the absence is a blessing. To take him seriously s to submit to obsession, to doubt, to magic, and then to escape these, or try to escape them, by willfulness, by the determination to stake all on an arbitrary selection of "things to be taken seriously" because the "save," because they are "his" affairs." (Note that even atheism takes seriously this god of consistency). But mercy breaks into the world of magic and justice and overturns its apparent consistency. It is therefore comic. It liberates us from the tragic seriousness of the obsessive world which we have "made up" for ourselves by yielding to our obsessions. Only mercy can liberate us from the madness of our determination to be consistent -- from the awful pattern of lusts, greeds, angers and hatreds which mix us up together like a mass of dough and thrust us into the oven. Mercy cannot be contained within the web of obsessions. Nor is it something one determines to think about -- that one resolves to "take seriously," in the sense of becoming obsessed with it. You cannot become obsessed with mercy! This is the inner secret of mercy. It is totally incompatible with obsession, with compulsion. It liberated from all the rigid deterministic structures which magic tries to impose on reality (or which science, the child of magic, tries to impose)! Mercy is not to be purchased by a set way of acting, by a formal determination to be consistent. Law is consistent. Grace is inconsistent. The cross is the sign of contradiction -- destroying the seriousness of the law, of the Empire, of the armies, of blood sacrifice, and of obsession. But the magicians keep turning the Cross to their own purposes. Yes, it is for them too a sign of contradiction: the awful blasphemy of the religious magician who makes the Cross contradict mercy! This of course is the ultimate temptation of Christianity! To say that Christ has locked all the doors, has given one answer, settled everything and departed, leaving all life enclosed in the frightful consistency of a system outside of which there is seriousness and damnation, inside of which there is the intolerable flippancy of the saved--while nowhere is there any place left for the mystery of the freedom of divine mercy which alone is truly serious, and worthy of being taken seriously. Freyr has asked the other members of WITNESS to write a blog post about what gives us hope. From a colloquial point of view these things definitely give me hope for the world and those who live in it. They may not correspond with the theological definition of hope, but when he asked us to contemplate these things this is what came to mind. To start, it’s the people around me that give me hope. Or, more precisely, their actions and desires that give me hope. I see a lot of things around me that attest to the teachings of the church about how we were created. Even those who get things drastically wrong can act as the face of our Lord in showing us love and justice. In terms of love, even those in eccentric or sinful love arrangements seem to possess a genuine desire to love and to be loved. It is quite common to see in even Hollywood movies (which generally show disastrous examples of loving relationships) a deep-seated and apparently real desire for love. The teachings of Holy Mother Church are almost always denied, but the desire to love is not ever denied, even in the face of sin and vice. It is always assumed that, deep down, love is a good to be pursued. Also, in the area of morality we see that the same desire for justice is deep seated within us. Take, for example, the actions of radical environmentalists. I do not condone either their beliefs or their actions, but these people strongly believe and act according to their sense of right and wrong. Both of the above things resonate strongly with me; love is obviously a very important thing for Catholics as we know God’s love for us, and we are to love each other. Also, the cardinal virtue of justice, though deformed in so many of us, is still very much a part of those whose actions can be quite disturbing. From these things, I take great hope, as well as faith that we are created as children of God and in accordance with the teachings of the Church. Let us pray that those who live according to disordered ideals and inclinations may see the error of their ways and reshape their lives to follow the will of God!